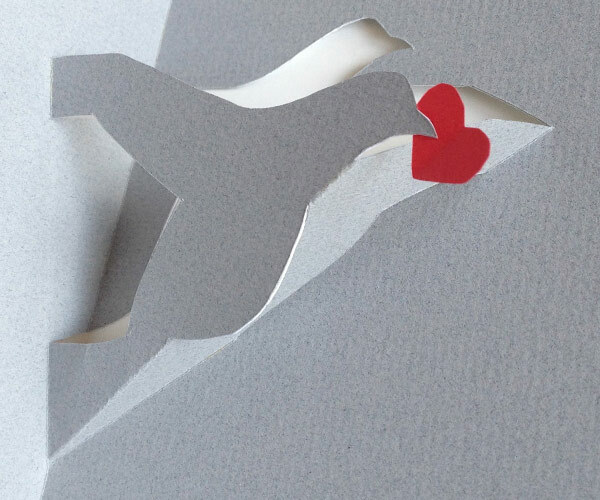 On white paper this is a dove, on grey paper, a messenger pigeon who will deliver your heart or any other message you choose to entrust to this pop-up. Attach a miniature envelope to its beak and send this as a thank you note or get-well card, or put an olive branch in the white dove’s beak for world peace. As you open and close the card the bird’s wings appear to flap gently. …with a template for this pop-up thank you card. You could also donate to a respected charity which promotes peace, such as Doctors without Borders, or the The International Peace Institute. The video below shows a tutorial for the pop-up stork, but since the paper engineering is very similar, it will help you understand how to make this card as well.